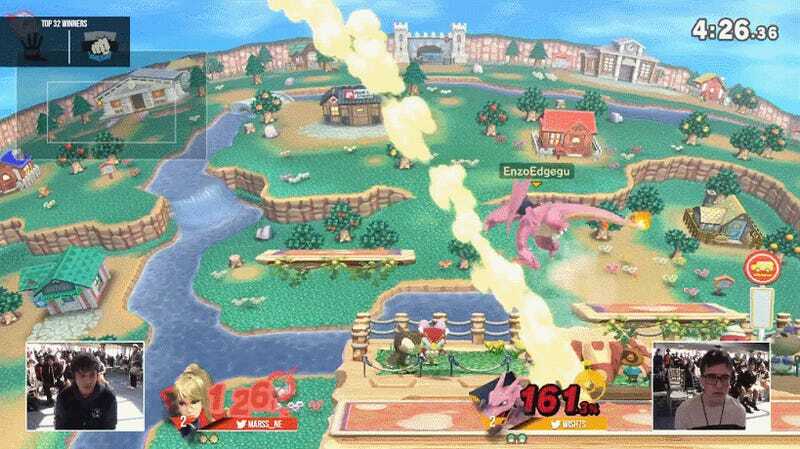 During Smash regional Collision 2019 in New Jersey last weekend, a Super Smash Bros. Ultimate match came to a halt when one of the competitors got annoyed with the gathered audience and walked offstage. This left tournament organizers reeling for over an hour as they tried to come to a solution for both players. By Sunday afternoon, Collision 2019’s Super Smash Bros. Ultimate bracket had been whittled down to the top 32 players. Tyler “Marss” Martins and Justin “Wishes” Magnetti had done well for themselves up to this point, and met in the winners side of the bracket to decide who would move one step closer to the finals. As they entered the fifth and final game of their set, however, Marss began to look agitated, at one point getting up and shouting something at the audience cheering behind them. A few moments later, he appeared to give up by walking away from the match, leaving his opponent and the commentary team stunned. It didn’t take long for word on what Marss was so upset about to come back to the broadcasting team. Apparently, someone in the crowd was calling out Marss’ game plan—in this case, his proclivity as a Zero Suit Samus player to jump after hanging on the ledge—which he felt constituted coaching his opponent. While there’s nothing in the official Collision 2019 guidelines that specifically discourages this, traditional Smash rules dictate that coaching is not allowed. This year’s installment of Genesis, one of the biggest Smash events of the year, directly forbade coaching during Super Smash Bros. Ultimate competition, and since many such rulings flow downwards directly from major tournaments to regionals like Collision, it’s generally accepted that coaching isn’t allowed anywhere unless specifically mentioned. Unfortunately, it wasn’t a matter of picking up from where Marss had abandoned the game, because Wishes, in his confusion, simply killed the now-stationary Zero Suit Samus with his Pokémon Trainer and ended the match. They needed an official ruling, something Marss hoped to get when he stormed away from the stage. After learning of the issue, Collision organizer Riddge “RJ” Mussington asked the attendee shouting from the crowd to leave the venue and then gathered his staff to discuss how to move forward. Half an hour later, they decided to restart the game with both players at two stocks. This was a huge boon for Marss, who had already lost a stock at the point he got up and left, and Wishes told the tournament staff to disqualify him if that was their ruling. From there, RJ discussed the issue with Wishes while the stream continued with additional matches, and they decided that they would return the game to the 2-1 stock differential while also artificially putting Wishes at over 100% damage, setting the scene much closer to what it had looked like before Marss walked away. After an hour and a half of deliberation, Marss and Wishes finally returned to the stage to finish their match. Marss won, but neither player seemed happy. The audience looked deflated. The excitement of the match had been ruined. Marss would go on to win the entire tournament, while Wishes would bow out of Collision 2019 at ninth place. The fighting game community is much different than other esports in that competitors play many of their matches either near or in the thick of the crowd. Where finals might occur on a stage removed from the audience, everything leading up to that takes place on the ground, making for a unique atmosphere that can’t be found anywhere else. Some players thrive in this kind of environment and some have to adapt. Many fighting game players (Wishes included) have drawn comparisons to a specific Tekken 7 match at Final Round, a traditional fighting game tournament held the same weekend as Collision. In the footage below, a group of spectators sing and dance around two players, one of which—Atlanta hype man Ricky “Pokchop” Walker—very obviously feeds off the energy. Did this contribute to him beating his opponent? Is this coaching? I guess it all relies on which side of the match you’re sitting. In the case of Collision 2019, the organizers felt there was a thin line between cheering on a friend and helping them with outside information, and they decided that Marss had a valid reason to call them over despite the fact that he abandoned Wishes in the middle of their match and went off on the crowd. But how does Pazda, the Collision attendee who shouted to Wishes and was eventually ejected from the tournament altogether, feel? Ian Walker loves fighting games and loves writing about them even more. You can find him on Twitter at @iantothemax.